The new year is in full swing and spring is vastly approaching. If you’re looking for an exciting Spring Break adventure, consider a Grand Canyon Skywalk Tour currently offered at the park. 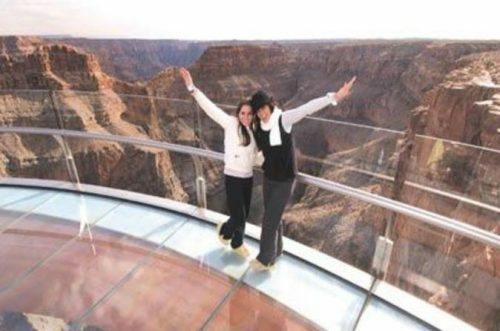 The Skywalk is a specially-designed structure suspended an amazing 4,000 feet above the canyon floor. The floor is constructed of glass, has no base support, and is projected 70 feet out from the rim. The structure has been designed to withhold up to 71 million pounds. It can withstand wind speeds of up to 100mph, and can remain standing during an 8.0 earthquake! The Skywalk is truly an out-of-the-ordinary adventure that will leave you with a multitude of memories. 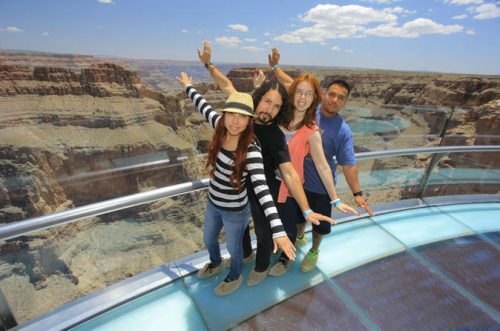 Here are the top-rated Grand Canyon Skywalk Tours in Spring! If you are a traveler that will book your Grand Canyon trip with a multitude of activities and require a tour that will allow you to quickly experience the engineering and the beauty of the Skywalk, you should opt for The Skywalk Express Helicopter Tour. Your flight will go over the amazing Lake Mead, the captivating Hoover Dam, and the beautiful Strip in Las Vegas. 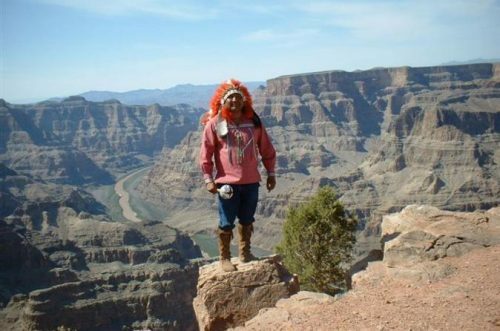 Once arriving in the Grand Canyon, you will find yourself in the real region of the Hualapai Indian Tribe. You will then be transported to the Skywalk, where you will get to enjoy the panoramic views for approximately 20 minutes. This is perfect for the traveler that lives life in the fast line and has a desire to experience all there is to offer while adventuring the world! Do you have a passion for the Native Americans? Would you like to explore the Hualapai Reservation, see Eagle Point firsthand, observe captivating and awe-inspiring cultural-based performances of the Native Americans? Do you have a natural interest in natural wonders? Would you like to explore the Grand Canyon in a new and adrenaline-pumping way? If you answered “yes” to any of these questions, The West Rim Adventure and Skywalk Tour is for you! In addition to riding in a Cessna airplane, you will get to take a boat tour along the grand Colorado River, and will be allowed to explore the Skywalk at your leisure! Do you enjoy touring the country by bus? Would you like to see the Hoover Dam in person? Does the idea of traveling to the ancient and mystical Joshua Tree Forest sound appealing to you? How would you like to travel to the West Rim of the Grand Canyon and witness the national park and the Skywalk in all of its beauty? If you find yourself craving this adventure, this Spring Skywalk Tour is for you!